Beach Olympics takes on a new form of fun with Boucher Brothers’ style. Raise the stakes. Lower your inhibitions. Level the playing field. Boucher’s custom-designed tournaments reinforce the principles of leadership, team work, and hard work. Brains and brawn are used to compete, bringing together the team in a way that’s often not possible in the office. Learn your coworker’s quirkiest quirks, and enjoy working with them more because of it. The activities provided simulate problem-solving, trust, cooperation, mutual support, commitment, open and effective communication and accountability. All activities are geared towards reinforcing a winning attitude towards a common goal, with non-stop laughter throughout! Whether your group consists of ten or 5,000, you will be in great hands with the Boucher Brothers. We will work with you to tailor activities based on your company’s needs, followed by impeccable planning and implementation. Events meet local Permitting and Insurance standards and include setup and breakdown of all equipment, facilitation of event, full uniformed referees and a Master of Ceremonies. The beach area will be specially designated for your group and decorated with lively colored flags and/or banners. Teams and the selection of a team captain may take place prior to arrival or on the spot. 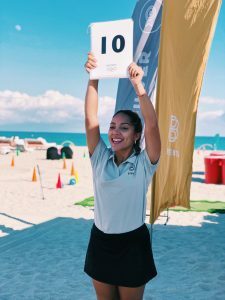 Our Beach Olympics referee will then explain the rules and regulations required to ensure a safe, fun and competitive experience. The games begin under the supervision of uniformed referees who will call the action and keep all the scores. A tiebreaker system is instituted for tie situations. For the grand finale, we present a ceremony to announce the winners and present awards, and may include personalized messages from the corporate leaders. Beach Olympics ensures an outrageously fun, learning and morale-boosting event that your team is sure to rave about for months! 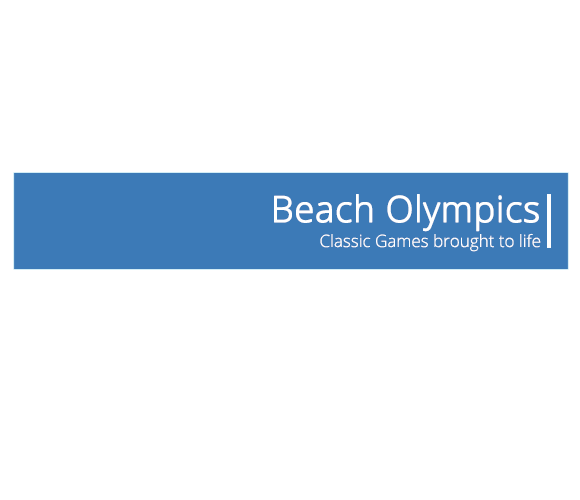 The Beach Olympics program usually runs between one to three hours, depending on your individual needs, activities selected and the size of the group. You can choose from our menu of challenges or let us to create a personalized program for you! A classic with a fun and competitive twist. Participants will excavate scrabble blocks from a sand pit to create as many words as they can. The team with the most letters used wins! Get running and get ready to get wet. This is an amphibious relay needed communication, coordination and collaboration! Quickness, dexterity and the ability to work as a team will be the deciding factor here. Work as a single unit to eliminate the accomplish your task! Teams will be separated and must use a large sling shot to sling water bombs to team members from a distance. The catches cannot pass the designated perimeter when catching the bombs. The childhood classic does not skip a beat here. Fight to the end and work as a unit! Communication & collaboration are key in this one of a kind challenge. Can you and your team stay calm under pressure? Teammates must work together to “Ski” across the sand on a 4 man Ski! Everyone must be in sync. A mash up if everyone’s favorite sport challenges combined into a relay race. Shooting and swing your way to first place! Participants must navigate a ball through a series of odd shaped pipes and race to complete the entire length of the course. The team to finish first wins. A challenging puzzle race where competing teams are tasked with completing a “sudoku style” puzzle. A relay style race across a variety of challenging obstacles that all team members will participate in. A race style game involving a bit of strategy – teams nominate one player to be carried by team members to collect a slew of items on the ground before the other teams do.